A Heartworm Society news release states: “By giving heartworm prevention every month, forgetful pet owners will have their pets protected when they need it most.” But doesn’t that also mean they get it when they need it least? Or need it not at all? Are you a “forgetful” owner? In this part of my heartworm series, we’ll discusses informed decision-making, and suggests ways, if you want them, to limit or eliminate heartworm drugs. I am a researcher and holistic health advocate, not a vet. Please learn the facts then discuss with your vet the appropriate course given your dog’s location, lifestyle, travel schedule, health, climate and the time of year. Expect an open-mind and respect from your vet, or find another vet. Just as with vaccination, “one size fits all” is outdated, profit-driven, lazy medicine. Take a look at the map above, courtesy of the Heartworm Society. Part 1 of this article demonstrated that transmission is heat and mosquito dependent. 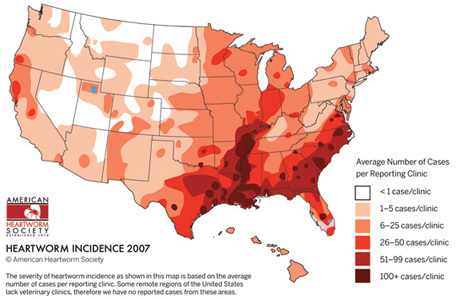 As expected, dark areas of the map, which show the most heartworm cases per clinic, are found in the hot, humid Southeastern US, especially the Atlantic and Gulf coasts and Mississippi Delta. Don’t let the map scare you. If published seasonally, map colors would pale significantly during cool months. Also remember that you’re seeing generalities, not specifics. A clinic near a rural pond will likely have many cases while an urban clinic 15 miles away may have a much lower incidence. Maps are general. Determine your own microclimate. Ask your vet how many cases of heartworm infection he/she treated in the past year. Also ask if he/she treats all positive cases, or just those with advanced infestation. If the vet doesn’t keep detailed records, that should tell you something. Conservative start/stop maps from heartworm researchers Drs. David Knight and James Lok (in “Seasonality of Heartworm Infections and Implications for Chemoprophylaxis”) show only two areas requiring year round heartworm meds: the southernmost areas of Florida and Texas. Houston, New Orleans and similar areas are shown requiring meds for 9 months. Other states range from 3-7 months. The Drs. wrote: “For nearly 80% of the states, the potential for heartworm transmission is limited to 6 months or less.” Here are start/stop maps for the US and California. Again, they are very conservative and very general. Do your own research and be specific. Does Year Round Medicating Bring Extra Protection? Applying suncreen at night is useless. So is taking heartworm medication when climate conditions prevent transmission. Only a small percentage of climes permit year-round transmission. Everyone else is unnecessarily subsidizing drug companies and “preventatives” sellers and, more importantly, exposing their dog to unnecessary risks. You’ve seen those scary photos of worm-strangled hearts, right? Shouldn’t you give meds year round just in case? Isn’t safe better than sorry? But is that harmless little pill or yummie medical “brownie” really safe? No drug is completely free of risk and adverse reactions. I can find no long-term studies regarding cancer risks and organ damage for dogs receiving heartworm insecticides year round (or even for a few months). Such a study would be difficult to conduct and very expensive. Who would fund such a study — or publish any negative findings? One clue to the possibility of adverse reactions should be label warnings: call your doctor immediately if ingested; keep away from children; wash your hands immediately after use…. How can medication be good for dogs but so dangerous for you? Another question: is your dog healthy enough for these medications? The “Heartworm Prevention” page of the American Animal Hospital Association states: “Healthy kidneys and normal liver functions are essential in metabolizing most medications.” Many dogs, including my Jiggy, do not have healthy organ function. I wonder how many unhealthy animals are nevertheless on meds? With any drug, study FDA and manufacturer information before medicating. These adverse reactions have been reported to the FDA by manufacturers. (Click the links for more information; write or call manufacturers with any questions). Terms you might not understand include ataxia (gross lack of coordination of muscle movements), pruritus (itchy dermatologic condition), urticaria (hives), mydriasis (excessive pupil dilation), and erythema (skin redness). Other terms should be self-explanatory. HEARTGARD and TriHeartPlus (ivermectin): Depression/lethargy, vomiting, anorexia, diarrhea, mydriasis, ataxia staggering, convulsions and hypersalivation. INTERCEPTOR (milbemycin oxime) reports the above reactions plus weakness. Sentinel (milbemycin oxime) reports vomiting, depression/lethargy, pruritus, urticaria, diarrhea, anorexia, skin congestion, ataxia, convulsions, hypersalivation and weakness. REVOLUTION® (selamectin), Topical Parasiticide For Dogs and Cats: pre-approval reactions of vomiting, loose stool or diarrhea with or without blood, anorexia, lethargy, salivation, tachypnea, and muscle tremors. Post-approval experience included the above plus pruritis, urticaria, erythema, ataxia, fever, and rare reports of death and seizures in dogs. Proheart 6 : severe allergic reactions (anaphylaxis): facial swelling, itching, difficulty breathing, collapse; lethargy (sluggishness); not eating or losing interest in food; any change in activity level; seizures; vomiting and/or diarrhea (with and without blood); weight loss; pale gums, increased thirst or urination, weakness, bleeding, bruising; rare instances of death. This product was voluntarily withdrawn from the market in 2004 because of deaths but has been reintroduced. Read my post Heartworm Protection: Do We Need ProHeart 6? For any other brand, research the product or its active ingredient before even thinking of administering it. Also, never give any meds without first learning if any vitamins, minerals, herbal products or drugs interact negatively with the medication. Note age restrictions. Most importantly, learn what symptoms alert you to a reaction. Important note: Collies, Australian Shepards and related breeds have a sensitivity to ivermectin (Heartgard and others). Beware any website or person professing the absolute safety of any medication. I’d like adverse reactions for pet medications to be included in all TV ads, as they are for meds for humans — but I don’t expect it. Reporting Adverse Events: Call your veterinarian immediately if you suspect a reaction to this or any other drug. Discuss alternatives and treatment and make sure the reaction is recorded in your dog’s file. The AVMA says : “… notify the US Food and Drug Administration (FDA) by contacting the manufacturer. The FDA requires that manufacturers of FDA-approved drugs forward adverse event reports to the agency.” Is the fox is guarding the hen house? Ask your vet to report the reaction, then follow up and make sure your vet did it. Under-reporting is common. (An estimated 99% of adverse reactions go unreported according to the FDA.) Click here for FDA reporting instructions. Microfilariae (babies) in the blood are detected by a different blood test. These show exposure, but do not detect female adults (potential breeders). Antibody tests (as opposed to antigen tests) are not preferred because they indicate only that the dog has been exposed to heartworms at some time in his or her life, even if the worms subsequently died. If you plan to give “preventatives,” test before beginning medication, preferably within a month of when daily temperatures consistently climb above 57˚ F. Read more at the Heartworm Society Serology section. Did you know that the latest canine movie star “Benji” was found in a shelter, infected with heartworms? Benji was treated successfully and went onto canine fame and a healthy life. Heartworms, like other parasites, don’t become life threatening quickly or inevitably. It takes at least 5 months, and more often 7-8 months, for a baby to grow to a reproducing adult — presuming the dog’s immune system doesn’t intervene. Also, adult males and females must both survive to breed. Important Note If your dog’s antigen test comes back positive, do a second test to verify results. Holistic vet Tamara Hebbler suggests that before you rush into treatment with harsh, poisonous drugs, you should get a cardiac ultrasound to determine the extent of the infestation. Heartworms, like other parasites, often live with their hosts without ever causing a dangerous problem. It’s quite common for animals in the wild to live entire lives with heartworms. (If worms always killed dogs, they’d soon run out of hosts.) Unless heartworms are re-introduced by another infected mosquito, the adults and their babies will eventually die off. When Should You Start Administering Meds — If You’re Going To? Dr. Margo Roman, an integrative vet from in Massachusetts, documentary film maker and Founder of the first-ever Integrative Health Pet Expo in Massachusetts this fall, tells me she begins medication six weeks after sees mosquitoes. This allows 2 weeks for the microfilariae (baby heartworms) to mature inside a mosquito to the infective stage and be transferred to a dog, plus 30 days additional days covered by the medication working backwards to kill those babies. When Should You Stop Heartworm “Preventatives”? Dr. Roman recommends stopping meds after the first frost for people living in an area with cold winters. In other areas, vets recommend stopping 30-45 days after weather is consistently below 57 F degrees and you see no mosquitoes. See Part 1 of this article, and the start/stop maps, for more details. Consumers often think that “preventing” as many parasites as possible with one product is a bargain — and ultimately safer for the dog. But why expose your dog to additional, unnecessary toxins? Most holistic vets will tell you to protect against only those pests (and diseases) your dog is likely to encounter. To see which products do what, see the “preventatives” comparison chart at Veterinary Partner. More than a decade ago — on June 4, 1998 — the FDA approved a 1/5 dose version of Interceptor heartworm medication, a product called Safeheart. This expensive field trial was conducted and the dosage approved — but inexplicably the product was never marketed in the U.S.
To duplicate the Safeheart heartworm “prevention” method — which you can’t buy — you have split the Interceptor dose into quarters. Check with Interceptor first, and ask your pharmacist or vet how to do this accurately. The recommended once-a-month dosage is 0.1 mg of milbemycin oxime per kg of body weight (0.05 mg/lb). (Interceptor’s regular dose of dosage is 0.5 mg milbemycin oxime per kg of body weight.) Print the FDA’s Safeheart report and take it to your vet for your prescription and additional instructions. Note: At this dose, only heartworms will be treated with the Safeheart method, not other worms or fleas. How Often Should You Give Meds? In his important book Homeopathic Care For Cats and Dogs, veterinarian Don Hamilton says of heartworm: “In dogs the “monthly” preventives are effective if given at six week intervals, and possibly even at seven- or eight week intervals….” Author/veterinarians Richard Pitcairn and Allen Schoen told us essentially the same thing when we were researching our book Scared Poopless. If you opt for this “less is more” treatment with “preventatives,” mark dosing dates on your calendar and don’t miss them. I presume that the monthly schedule was designed for the ease of remembering when to give meds. However … giving meds monthly rather than every 45 days requires more doses — and offers more opportunities for adverse reactions. For someone medicating year-round, that’s 4 fewer doses per year. Are There Natural Heartworm Preventatives? Is mosquito control 100% effective? No, but Mosquito.org has some great tips. (Note: one study showed that a full moon increased mosquito activity by 500%.) Find more information on controlling mosquitoes in this University of California report. What do I do? Well, for me, the choice was easy. I live in So. California. I rarely see mosquitoes. My dogs spend most of their time indoors. Nights are invariably cool. With the advice of two local vets, I decided to protect my own dogs (both of whom have health challenges) against the toxicity of heartworm “preventatives” rather than protect against an unlikely infection. I use non-toxic alternatives like mosquito control, an excellent diet and no drugs unless they’re absolutely unavoidable. I increase safety by testing blood twice yearly. I haven’t used “preventatives” for five or six years and my dogs remain heartworm free. This is my personal decision. I am not a vet. If I lived in a mosquito-heavy area, however, I might do much the same. I would determine local risks and would consult a local holistic vet to get help preventing heartworms naturally. I would control mosquitoes and test blood twice or more yearly. Someone who had “outside dogs,” and who was the nervous about heartworms, might also use heartworm meds or the Safeheart method during the peak heartworm months of July and August, but only if their dogs had healthy kidneys and livers. They should make any decision with a knowledgeable vet. Dr. Will Falconer, a holistic vet certified in acupuncture and homeopathy, has written an e-book called “Drug-Free Heartworm Prevention.” This 50+ page, well-written e-book is delivered electronically. I do not profit from sales of this book although I was given a complementary review copy. Drs. Richard Pitcairn and Martin Goldstein have also written about heartworms in their books. Please leave us a comment and let us know how you liked this article. Tell us about your concerns and decisions. If we have made any errors, please let us know so we can rectify them. And, please, tell your friends the facts behind heartworm transmission. Most importantly, do not make decisions out of fear. Don’t let anyone, even your vet, intimidate or ridicule you. Be an educated consumer and a rabid advocate for your dog’s health. Disclaimer: The information provided here is for educational purposes only. Do not rely on this information without doing your own research including consultation with your own veterinarian. Do not buy or fail a product for treating heartworm without evaluating it carefully. Brenda, if your dog was on medication all year then the manufacturer’s guarantee should cover any expenses. More importantly, are you sure your dog has heartworms again? I am not a vet or pharmacologist, but I bet you that the test is reading the previous infection. Call the manufacturer and discuss this with your vet. Some vets use heartworm “preventatives” to kill heartworms so it seems unlikely to me that your dog has a new infection. Investigate further. Jan, you say you test your dogs’ blood twice a year. What would you do if they came up positive? What treatment would you follow? I live in central Texas and our neighborhood has a standing-water pond, and while I want to cut down on the chemicals they receive, there is a lot of HW here. Donna, I’m not a vet and can’t recommend protocols. It sounds like you’re in a very high risk area. I live in a very low risk area, so our situations are vastly different. You might talk with a holistic vet in your area. There are a least a few who still don’t use chemical meds, but I’m not an expert in what they do. Did you read part 2 of the heartworm article?